Roosevelt Island, Randall and Ward Islands, Rikers Island, North Brother Island…you may have heard of one or all of these NYC islands, but do you what they have in common? Today, the Hot Wheelers learned that all these islands historically hosted (in some cases, still host) marginalized populations. We asked the Jump Streeters what kind of people they think would be marginalized. The answers given ranged from crazy to dangerous to just plain bad—bingo! For example, we learned that Rikers Island is still the city’s main jail complex. Or that Typhoid Mary was quarantined on North Brother Island. As interesting as all the islands are, our focus today was Roosevelt Island. Previously known as Hog Island, Blackwells Island, and Welfare Island, Roosevelt Island was known for hospitals, a prison, and an asylum. A good way to think about it, when you write on a piece of paper, you avoid writing outside the MARGIN! Or, thanks to Jewel, when you are riding a bike in the city, you are marginalized to bike lane. There are some not-so-good kinds of marginalizations however–such as poverty or language based. Once we learned all about how interesting the islands are, we grabbed our bikes and headed to the East River. We had a bit of a bumpy start when Tymel’s bike had some technical issues, but a team is a team and we waited like one for our beloved teammate. Once we mounted our bikes, we headed North to the Triboro Bridge. Once we got across the bridge, we were in Queens! You know what that means—everyone got their Queens Badges today! We rode by Socrates Park and took a lunch break before heading to the Roosevelt Island Bridge. 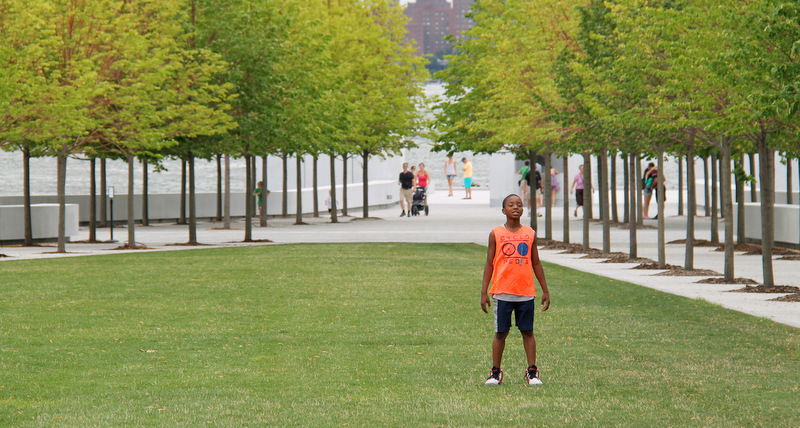 At Socrates Park, we saw some really funky sculptures. Some Hot Wheelers even went inside one of them! We were pumped to finally be on Roosevelt Island! We were relatively North on the Island, so we headed to the South-most tip to check out the abandoned Smallpox Hospital and the FDR Four Freedoms Park. Tired after a long day, we embarked on the final stretch to Stanley Isaacs. This time, we took the Queensboro Bridge and came up 1st Avenue. The bridges were hard and tiring, but the Hot Wheelers saw some beautiful views and everyone was a trooper!